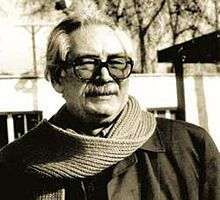 Ahmad Mahmoud (Persian: احمد محمود‎‎; December 25, 1931 in Ahvaz, Iran – October 4, 2002 in Tehran, Iran) was a prominent Iranian novelist. One of his works, The neighbors stands out as one of the most notable novels in modern Persian Literature. He was known as a distinguished social realist writer; by his works mainly concerning the lives of working class and lower class families in the urban societies of the South of Iran, especially in Khuzestan. In his youth he worked as a day laborer, driver, construction worker and suffered imprisonment for leftist political views and oppositionist activities. His first story appeared in Omid-e Iran magazine, and in 1959 Mahmoud began publishing collections of stories with Mul (The Paramour). Other collections followed: Darya Hanuz Aram Ast (The Sea Is Still Calm) 1960, Bihudegi (Uselessness) 1962, Za'eri Zir-e Baran (A Pilgrim In The Rain) 1968, Pesarak-e Boumi (The Little Native Boy) 1971, and Gharibeh'ha (The Strangers) 1972. Modern Persian Short Stories (1980) features a translation of his 1969 story "Az Deltangi" (On Homesickness) from A Pilgrim In The Rain. Hamsayeha (The Neighbors) appeared in 1974 and gave him immediate status as a novelist. Dastan-e Yek Shahr (Story Of a City) was published in 1981. Zamin-e Sukhteh (The Scorched Earth) was published in the spring of 1982 in a limited 11,000 copies, with a second printing a year later of 22,000 copies. The three novels are a continuing saga set in Khuzistan during three important periods: The days of nationalization of oil in 1951, the aftermath of the coup d'état which brought the Shah back to the throne in late August 1953, and Iraq's invasion of Iran in 1980. In early 1990s Mahmoud published two collections of short stories: Didar (Visiting) 1990, Qesseh-ye Ashna (Familiar Tale) 1991, Az Mosafer Ta Tabkhal (From Passenger To Cold Sore) 1992, Madare-h Sefr Darejeh (Zero Degree Orbit) 1993, Adam-e Zendeh (The Live Human) 1997, and Derakht-e Anjir-e Ma'abed (The Fig Tree Of The Temples) 2000. Mahmoud's last book won the "golshiri's book prize" and garnered much acclaim. In memory of his brother who died in the Iran-Iraq war, he wrote "the burned ground". Ahmad mahmoud Had a realist style of writing and was essentially a technical author. His book "the neighbours" was banned pre-revolution and is also banned currently post-revolution. Like many other writers in Iran, his potential and abilities was wasted due to the heavy censores and lack of attention and the difficulty and Disrepectful ways that the government treated it's artist and is still treating them today. Mahmoud was also a member of "kanoon-e-nevisandegan-e-iran". Mahmoud died of respiratory failure in Tehran at the age of 71. ↑ "The 2001 Golshiri Awards". Golshiri Foundation. Archived from the original on July 3, 2013. Retrieved April 6, 2014. ↑ Shataw Naseri (5 June 2014). "Houshang Golshiri Awards". The Parsagon Review. Retrieved July 5, 2015.